Christmas Cactus or Thanksgiving Cactus? Christmas cactus is a favorite holiday plant because it unfailingly blooms during the holiday season. Depending on conditions and which variety you have, blooming can begin as early as November. You can find commercial growers or plant outlets who specialize in holiday cacti as well as other plants online. It is possible to order your Christmas or Thanksgiving cactus in bud just in time for the holiday season. Growers have the facilities necessary to time the blooming cycle by controlling temperature and light conditions. Holiday plants are the perfect answer if you want to give something unique and lasting as a christmas gift. They will be happily received especially by plant lovers or your gardening friends. Chances are good that your Christmas cactus is in actuality a Thanksgiving cactus. Because of various cultivars and hybridization, there appears some confusion as to scientific names for either species and we wont attempt to tackle that here. The true old fashioned Christmas cactus has a pendulous habit with glossy flattened leaf segments and its pink blossoms are somewhat smaller than the thanksgiving cactus. The Thanksgiving cactus has larger more flamboyant blossoms which are displayed with a slight upward tilt from their growing point. Neither variety has any noticeable scent. An additional point of identification is that the Christmas cactus has smoothly rounded leaf segments whereas the Thanksgiving cactus has distinctive sharp points on the leaves. Hybrid Thanksgiving cactus colors range from almost pure white through yellow, rose, pink, orange, purple and dark red with white markings. Neither plant is a true cactus as we know it, but both are epiphytes from tropical jungles and as most other succulents, need more water than conventional desert cacti. However, soil should be allowed to dry slightly between waterings and more so during the dormant period which begins after flowering. They enjoy bright, but filtered sunlight throughout the year. Fertilize every two weeks during the growing season with half strength soluble plant food. Stop when growth reaches maturity. The plants will set flower buds on the tips of new growth and in the axis between leaf segments in the fall when the days grow shorter and nights are cooler. In order to get your Christmas cactus to set buds, night time temperatures need to be reduced to 55/65 degrees and plants must have complete darkness. Watering should be reduced somewhat during this time - keep on the dry side, but not so much as to cause wilting. For a period of 8 weeks starting in mid-September the plants require at least 13 hours of total darkness at night. If you are growing Christmas cactus in an area in your home where you are likely to turn on the lights at night or streetlights come through the window, put your plants outside or in an unheated room where they receive bright but filtered sun during the day, but away from any kind of artificial light during the night. Take care that temperatures do not drop below 40 degrees for any extended period of time. This will cause damage to the plants and will most likely result in bud drop. Once buds are well developed, the plants can be brought back inside to enjoy. 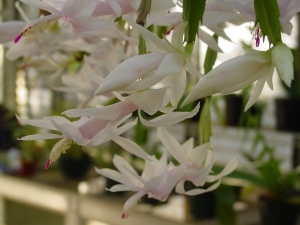 Christmas cactus propagation is by division of larger plants, but more often by stem cuttings. Take cuttings consisting of 3 to 5 segments during spring and early summer. The mother plant you are taking cuttings from will not suffer from this procedure. On the contrary, the remaining stems will continue to produce fresh growth and very likely more than one new branch will arise from the cut end, or just below it. Cuttings will root readily in water, but have a tendency to rot, particularly if left standing in stale water. Growth will be stronger when allowed to dry off slightly (1 to 2 days) and then inserted directly into a good moist seedling mix to a depth just slightly over the first segment so that the axis is below the soil level. This is where new roots will develop. Keep moist, but not wet, in bright indirect light and you should see new root growth within 2 to 3 weeks. If cuttings are taken early enough in the season, they will often flower the same year. Both Christmas and Thanksgiving cacti make excellent houseplants and enjoy being somewhat rootbound, which means you do not need to repot unless the soil begins to break down. Some specimens actually do quite well being in the same container for years. They will also benefit from being kept outdoors during the warm spring and summer season. Give them a spot in a semi-shady area such as a screened porch or suspend from tree branches. Plants are particularly attractive when planted in hanging baskets which show off their bloom to best advantage.